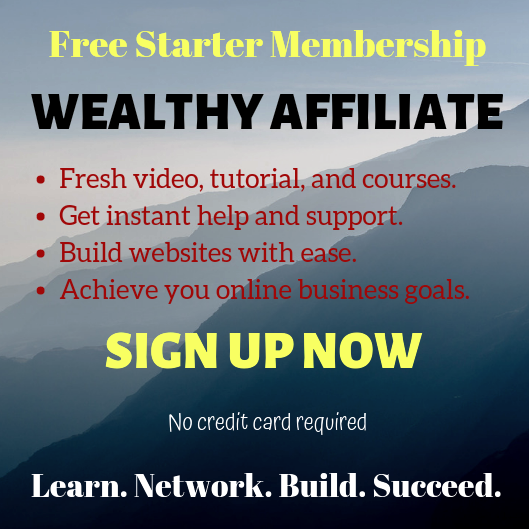 November 18, 2018 March 16, 2019 Alice A.WealthHow to start blogging to start making money., Is blogging for everyone?, Should you start blogging to make money online? If you’re seriously looking for ways to make money online, you must have come across many articles and videos telling you how blogging can make that wish a reality. But what is blogging all about? Is blogging for everyone? In this post, I will be talking about blogging and how you can start building a profitable money-making business simply by learning the mechanics of this art. Yes, I call this an art because it involves more than just skills – it has something to do with what you love and enjoy doing. A blog (short for weblog) refers to websites that contain information on various topics that range from personal to the religious or political. Most of the time, blogs focus on one narrow subject rather than a whole range of subjects, depending on the interest of the blogger. In simpler terms, a blog is a platform where a writer or group of writers share their views on an individual subject. One important thing to note about a blog is that it needs frequent updates. Since its goal is to provide information to its readers, the contents must have the potential to offer something new each day, week or month. Also, since blogs promote reader engagements, readers get a chance to comment and express their personal opinions or concern to the owner of the blog site and its viewers. 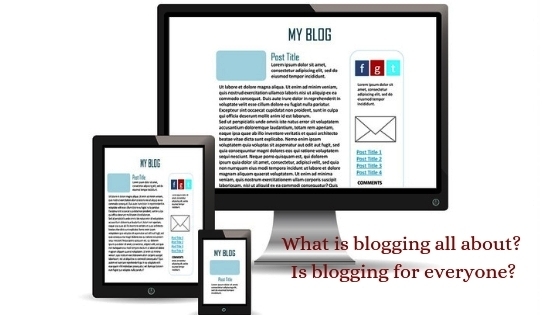 What is Blogging and Why has it Become so Popular? Blogging in its original definition involves a person talking about how their day has been. It’s like journaling their experience from a day-to-day basis; kind of like a modern version of a personal diary. The only difference is that you get to share it with your readers or viewers by making it available online. Today, blogging has a new concept. Blogging is writing about an event, a situation or topic in a blog. It is a means where one shares their knowledge and expertise on certain topics in order to help other people with the information they need. Blogging did not become popular until the introduction of WordPress (WP) in 2003. WordPress started offering free blogging platform which many people have found useful because it’s easy to install, maintain and use. 1) It became a mainstream source of information. People create blogs in order to deliver valuable information and news to other people over the internet. Did you know that there are over 2 trillion Google searches per day just this year (2018)? What more, according to Internet Live Stats, there are 5.5 billion searches done on Google per day or over 63 thousand search queries done per second. That’s a lot! People access the internet every second for information on about just anything. 2) Companies promote their products through blogging and keep their customers and clients up to date. Business owners can grow and scale their business by having a platform to interact with their potential customers. The more people visit your blog, the more exposure and trust your brand gets. 3) You can earn money through blogging. Yes, you can actually make money blogging about your passion or interest. Once your blog gets enough attention (they call it traffic), you can start looking into ways to monetize it by offering your services and selling valuable products – yours or others’. Now that you know what blogging is all about, you might be wondering if you should start your own blog. In one of my articles, I mentioned that one of the benefits of being in good shape or health is it enables you to achieve financial success. And one of the ways to accomplish that is by having your own blog site. How would you like to quit your job and make blogging your primary source of income? As I said, blogging is not only a means to share your views on certain topics; your blog has the potential to replace your job. Your question now might be: “Where do I start and how?” Here are the basics of starting a blog and building a successful online business. 1) Choose the right niche for your blog. What are you passionate about? The idea here is picking something that you’re interested in and start writing about it. That’s what a “niche” is all about. One common mistake even veteran bloggers commit is choosing a niche that they have no interest in. When you start blogging, it’s important to see it as something you can do for “long term” and that is why it is advisable to choose something you love and enjoy writing about. If you are having fun with your blog, you have a higher chance of becoming successful. 2) Build a website, choose a web platform and host for your blog. Building a website used to be a very complex task especially for those who have no idea about basic HTML (Hypertext Markup Language) and web design. But all that has changed, thanks to WordPress. Website building has become simple and easy that anyone can build a website in just less than 30 seconds. *Note: HTML is a standardized system for tagging text files to achieve font, graphic, color, and hyperlink effects on World Wide Web (www) pages. WordPress is by far one of the biggest blogging platforms in the world. As of today, there are now more than 82 million active users, which is massive. But the best thing about WordPress is that it is now incorporated in site builder platforms such as the one I am using. Choosing a host for your website is another thing you need to consider. There are tons of platforms that offer free blogs, such as WordPress, Tumbler, and Blogger to name a few, and that’s great. However, if you choose a free alternative, you won’t be able to fully monetize your blog. That is because you don’t own your blog and there are limits to free blogs. Check out my RECOMMENDED PLATFORM for easily building a website for free. 3) Get rankings and attract visitors. In order to make money, you need to get people to visit your blog. You accomplish this by writing relevant contents that convert and getting your site ready for SEO (Search Engine Optimization). Applying proper SEO techniques will give your posts and pages high rankings on search engines such as Google, Yahoo, and Bing. Again, my recommended platform will teach you exactly how to do that. The best part is you can start building 2 websites for free. You can start promoting your products or other peoples’ product once your blog site starts getting traffic. If you have no products to promote and sell, there are various affiliate programs you can take part in. Are you still unsure if blogging is for you? If you’re like most people who want to have time freedom and financial freedom, you might want to consider blogging as a means to replace your day job. More and more people are searching for ways to make money online so they can work at their own pace and time. They want to get out of the “rat race” that they are willing to start all over again and do something that they actually enjoy. I’m not saying that working in front of your computer in the comfort of your home or anywhere else as long as you have a laptop and internet connection is what everybody wishes for. There are people who are passionate about helping other so they started blogging for that purpose and still keep their jobs. If you love working for someone else until retirement, then I wish you well. But if you’re open to building a blog and eventually make blogging a full time job, you can check out my review of my recommended platform by clicking this link. Previous Previous post: Does Stress Cause Thyroid Problems? Next Next post: What Are The Health Benefits Of Drinking Lemon Water? Interesting read. I couldn’t agree more to what you have said. And you are definitely right, choosing a niche before starting a blog is the most important factor to be put in consideration. It should something you have knowledge about or something that you are wanting to be educated about. A very good tip for those who are starting out. I got stucked in this step before I started my blog, it took me a while to analyze what I want. I didn’t know that it’ll be that hard. But luckily with some help, I got over it, and slowly getting used to it over time. So, is blogging for everyone? I think the answer will depend on the one who wants to enter or try blogging. Hello Mina, thanks for dropping a comment. Yup, choosing the right niche is very important. I did pick the right niche but I think I made a mistake in that it is a broad one. I should have made it more specific, and there’s no going back now. Anyway, I am glad to hear that things are eventually turning great for you, thanks to the people who are always willing to help out. If we are really determined to make blogging a full time job, we will find ways to make it work. I know some people who are interested in starting a blog but they’re not sure how. the common reason I hear is, “I am not a good writer, my grammar is terrible, etc.” And so I tell them that there are platforms that offer free training, like my number 1 recommended online program. I am new to blogging, but I’m enjoying it, thanks to Wealthy Affiliate. It took me a while to really get active, but I’m loving it. Because of my job, I don’t get to spend as much time as I would like to. My goal is to be able to make enough money from this so I can reduce my hours at my present job or maybe even quit. The best thing about blogging is that you can build a successful business at your own pace. You are right, there are millions of people looking for financial freedom or even an additional income. This is a great way to achieve that. I’m a new blogger too and I’m lovin’ it. Just like you, I also have a full time job and trying to balance my time between work and blogging. It could be difficult at times but we need to keep our focus and work hard so we won’t have to struggle trying to divide our time. Having a definite goal like quitting our day job is a great motivation. Of course, it’s great that we enjoy what we are doing but we need to have a clear purpose for all these, otherwise we will still find ourselves in the same spot after many years. So cheers to our financial freedom that’s coming! Wow …Thank you for writing how to start a blog in the simplest terms and you’ve convinced me to start a blog as you mentioned, “Some people also blog for the purpose of gaining more knowledge.” Maybe I’ll start a blog about farming. Can you give a little advice for a new blogger? I believe that everyone has a passion or interest and want to spread the word. If you want to start a blog on farming, I suggest you start reading and researching about this topic. Before you even build your site, you need to have a clear concept or like an outline of the topics you will be talking about in your blog. You may want to research about how to make the soil more fertile, what crops will produce more on certain seasons, the kinds of fertilizers that are specific for every produce, things like that. I hope this helps. Wishing you the best as you start your blog about farming Fadli. I first started blogging a number of years ago now, and I have to admit, my initial mistake was one of the points you cover in your article here. Well, I didn’t choose an initial niche that I was interested in – I went for one that was ‘lucrative’ in my eyes, and man did I struggle to find the power to blog about it. It become very tedious writing about a subject you have little interest in. How often do you blog – and what do you feel should be the frequency of publishing your posts? Thanks for stopping by. It’s pretty easy to fall into the pit of niches that seem to offer golden opportunities. That is why it’s always best to start a business that will not make you feel like working because you have to but because you enjoy what you do. Unless you’re willing to invest a large amount of money to pay people who will write for you. But I do not advice this. I have two blog sites in different niches, big mistake I must say. If I were to start all over again, I would focus on just one website. Anyway, when I was in the initial stages, I blogged and published 2-3 times a week. But if you want faster results, you should publish a new post everyday. Do you know that some even publish 2-3 posts a day? This is impossible if you have a full time job like me. Again, like i said, one post a day is fine. I hope that helps. Hello Alice. I hope you are having a good time with the season. Happy thanksgiving to you. I enjoyed reading through this piece which actually talks about the art of blogging. Yeah for sure, blogging has the potential to make one full time income. I have seen and have read of many success stories. But when going into blogging, one should know that it will take some time (maybe up to a year) before one can start making money from blogging. Many people quit blogging because of this. I want to start blogging soon. Knowing this will keep me going. Hey Barry, happy thanksgiving to you too. You’re exactly right, making money from blogging does not happen overnight. One needs to really work hard and spend a considerable amount of time building an authority online. If you want to make blogging a full time job, you first need to build trust among your potential customers and this will take time. It may take a year or at least 6 months if you really put in the hard work. Personally, I wasn’t looking to make money when I started my very first blog site. I just wanted a platform to share what I was passionate about. Only after I was already on it that I realized I can actually monetize my blog. One thing we need to understand is that before we even think of the money coming in, we need to have the intent to help others first. Yes, one of the reasons most bloggers fail is they get into blogging thinking it’s gonna be easy and quick. Just like any other business, you need to build it first and then gain customers. Thanks for reading the article and dropping a comment.